The efficient and professional exercise of the first Romanian EU Council Presidency is possible upon a thorough preparation that adds pressure on the national system for coordination of European affairs to adapt its administrative and coordination capacity not only with regard to logistical aspects of the Presidency’s activities, but also to the elaboration of the political programme implemented during the six month mandate. Hence, concerted action involving both the central public administration and non-governmental actors is necessary to maximize all the expertise available on EU issues in order to build a strong European outlook for the Presidency role. The paper assesses the Council Presidency’s potential to affect the development of the coordination system in the long run related to its nature in terms of the degree of inclusiveness of non-governmental actors in the process of defining the national position on European affairs. In this sense, an analysis of the framework for cooperation between the government and the civil society representatives in general and in the context of the preparations for the Presidency was conducted through the theoretical lens of the critical junctures concept in order to establish whether the transformations triggered by this event might have reorganized the pre-existent institutional arrangements of the system. The analysis has revealed that although the involvement of civil society actors in European affairs has increased in the last 2 years, a close cooperation with the Government is unlikely to continue in the future past the Presidency, meaning that the latter fails to be a critical juncture in the development of the coordination system. Researchers’ attention for the Game Theory increased during the Cold War, and even more after this moment, therefore nowadays it is being used in multiple domains. This evolution led, inevitably, to the overuse of different concepts and/or elements, an eloquent example being what happened during the Ukrainian crisis of 2014 and after it. The main purpose of this paper is to examine the ‟race” for Ukraine between the Russian Federation and the West, analysed through the concepts of zero-sum games and mixed-motive games. The research will focus on the Russian state. The conclusions of my endeavour are that the zero sum-games are too simplistic and are not the appropriate tool to use to understand the foreign policy of the Russian Federation, whereas the mixed-motives games are more suited for this kind of process. Mixed-motive games; the Russian Federation; the West; Ukraine; zero sum-games. Some of the biggest challenges states in the Western Balkans are facing since the end of the Cold War are non-traditional security threats. Although recent studies have argued that “history has returned” and that traditional security threats have come back to become core challenges for states, authors of this paper argue that due to geopolitical, political, economic and cultural factors, the states in the region suffer more from non-traditional or “soft security” rather than “hard security” threats. In this paper, the authors are focused on two of such threats: organized crime and terrorism. The region of the Western Balkans is quite vague and imprecise as a concept, and for the purpose of this paper, we use the term to refer to the former Yugoslavia, excluding Slovenia and Croatia and including Albania. Two methodological approaches are used: discourse analysis and semi-structured interviews. The paper consists of three parts. The first part deals with the theoretical and conceptual change of security in the Western Balkans by focusing on key security challenges which the states are facing. In the second part, the paper identifies main contemporary threats, focusing on two most significant threats: transnational organized crime and terrorism. In the third part, the paper analyses alternative approaches that these states can use to overcome these security threats. International, regional and national security, security challenges, terrorism, transnational organized crime. The paper assesses the EU crisis management in the South Caucasus with a particular focus on the South Ossetian conflict. The EU engagement in the South Caucasus dates back to 2003, when the region gained importance for the EU as an energy transportation corridor between East and West, as well as for security purposes, in terms of building “a new chain of friends” outside the EU borders. 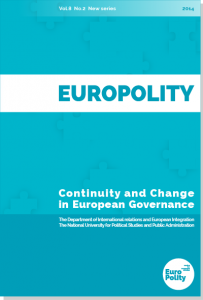 At the same time the EU introduced a wide range of institutional structures and coordination mechanisms over multiple policy domains of crisis management. In contrast, the increased EU presence in the region did not contribute to coherent crisis management in South Ossetia. The involvement of multiple institutional actors in the planning and implementation phases of CFSP and Development Aid has increased the institutional fragmentation within EU`s crisis management architecture creating a need to establish coherence in their actions. The paper argues that the incoherence in EU crisis management is undermined by the overlapping mandates of EU institutional agents in the two main policy areas: the EU’s Common Foreign Security Policy (CFSP) and Development Aid Policy (DAP). The impact of the mandate overlaps on incoherence is empirically analysed through the prism of the bureaucratic politics theoretical framework. The aim of the article is to show how in Italy the traditional inequalities in class, gender and geography have been matched by an inequality linked to immigration, whose causes, forms and social consequences I will analyse here. In so doing I will underline how such inequality linked to immigration is an integral part of the system of social inequalities existing at global level and in particular it is part of the globalization of inequality linked to immigration. Over the last few decades, there has been a deep social transformation at world level which has changed the system of inequalities; new inequalities were created, among which, the inequality linked to immigration is rather important. Historically, this is certainly nothing new, yet we are witnessing a globalization of inequality linked to immigration, which refers to disparities and social advantages that affect immigrant populations and citizens with migratory background. This phenomenon has several causes, but it is mainly due to two elements: the systematic use by several countries of an exploited and stigmatised migrant workforce, kept in a condition of social inferiority and with half the rights of the rest of the population; the globalisation of selective, restrictive and repressive immigration policies. Such process is quite visible in Italy, where inequality based on immigration is the result of the combined action of labour market, legal system, and mass media, which have pursued rationales, which led to the social inferiority and segregation of immigrants. Such inequality involved specific generative mechanisms such as the selection, precarisation and differential exploitation of migrant workers, the creation of a special legislation, the systematic stigmatisation of immigrant populations in the public discourse, the comeback of the rhetoric of assimilation. Such inequality is multidimensional as, from work to health, from living to education, from public images to legal conditions, it affects all aspects of the social life of immigrants; and it is a challenge to social citizenship. The Ukraine crisis and the events that followed have brought about an unprecedented strain within EU-Russia system of relations, highlighting the major drift between Russia and the Western, liberal world. EU’s deficiency to predict the lack of results in influencing Russia’s agenda has translated into an incapability of understanding the Russian mind-set: for the Russian society, the economic crisis and welfare deficit, as a direct result of Western sanctions, did not materialise into a decline in the population’s support for Kremlin, nor into a rising criticism towards the president as being held accountable for the country’s economic situation. On the contrary, the popularity of President Putin has increased considerably since the crisis in Ukraine. A significant explanatory power of such trends resides in the historical incrementalism of the Russian society with deep roots in a series of dramatic events and sudden changes over the last century. Thus, the current paper revolves around capturing Russians’ attitudes and perceptions regarding the concept of liberalism and the Western model of democracy, through in-country expert interviews; such an approach could contribute to a better understanding of the Russian society and implicitly to building a more effective dialogue and communication between the two actors. The Eastern Partnership region is currently going through a process of institutional formation and consolidation in which promoting public ethics can play a major role in the legitimacy of its administration and attracting foreign investors. Through various datasets, we explore here the level of corruption in the region, as well as the measures that could be employed to counter it. The first section aims at assembling the conceptual references of corruption. Secondly, the analysis turns to the manifestation forms and the assessment of the extent of the phenomenon. Finally, this paper looks at the potential remedies. In this section, the paper also deals with some of the anti-corruption approaches, as we assess preventive and corrective measures, and discuss the potential contribution of adopting international benchmarks of ethical behaviour in the public sector, such as the ISO 37001 Anti-bribery Management Systems. The Western strategic vision about the East lies at a crossroads. Similar to the Interwar Era, when acts of unilateralism in foreign affairs and aggression by the revisionist powers under popular but militaristic leaders have triggered the outbreak of World War II, the West seems unable to act coesively and decidedly to counter the contestation of international law and order. Therefore, a better understanding of the past lessons and negative impact of the “functionalist” spillover of power personification is at stake.